2 Where does PA online gambling stand? 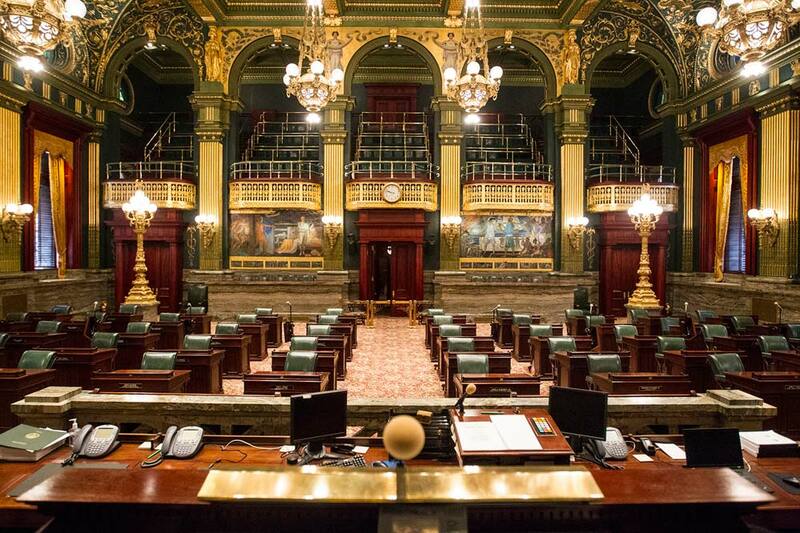 It was a whirlwind of a week for Pennsylvania online gambling watchers — one which saw the House of Representatives pass yet another gaming reform bill, and ended in the state’s two legislative chambers locked in a game of chicken over gaming expansion. For now, online gambling proponents can take a breather, as it’s unlikely the Senate will take any action, or even address online gambling, until after the elections. The Senate tried to push online gambling to the sidelines for the remainder of 2016 by adding a temporary local tax share fix amendment to a responsible gaming reform bill, HB 1887. That, instead of melding the tax fix into a comprehensive gaming reform bill, HB 2150, that includes the legalization of online gambling. The Senate’s decision to kick both issues down the road was seen as the end of the line for online gambling in 2016. But a day later, the House of Representatives was able to inject a bit of hope back into the process. Despite extremely pessimistic comments from Penn National during an earnings call, and a number of analysts declaring online gambling dead, the House revived the issue by amending the bill sent to it by the Senate on Wednesday. The newly amended bill passed by a 108-71 margin, marking the second time this year a gaming reform bill cleared a vote in the House in 2016. Where does PA online gambling stand? After a week of lobbying, source chatter, amendments, and votes, online gambling is in a slightly superior position from where it was a week ago. It’s still waiting for consideration in the Pennsylvania Senate, but it’s now tied to the local tax share fix. The House has provided the vehicle to solve all the state’s pressing gaming and budgetary concerns, and kicked the ball back to the Senate. Hanging in the balance is online gambling and daily fantasy sports consumer protections, $100 million of online gambling revenue earmarked for the state budget, and $140 million in taxes local communities rely on to fund basic services. Despite the seeming urgency, don’t expect the Pennsylvania Senate to take action on the bill until after the elections. The next scheduled session day for the Pennsylvania Senate is November 16, and it would be a surprise if the Senate decided to tackle this issue before then. Senate leadership could add a session day between now and then, but this seems unlikely, as the Senate has shown less urgency than the House when it comes to gaming reform issues, and far less of an appetite to legalize online gambling. Most of the chatter in Harrisburg indicates the issue will be addressed post-election. After the House passed the amended version of HB 1887 on Thursday, State Senator Pat Browne intimated to the Morning Call that the Senate would consider the bill after the elections, and wouldn’t be adding session days. Pass HB 1887 as is, or make minor changes that should allow the bill to pass the House, perhaps stripping out the airport gambling provisions. Radically alter the bill and send it back to the House, essentially playing a game of legislative hot potato when it comes to the local tax fix and online gambling. Try to address the local tax share fix as a standalone issue and hope the House acquiesces and passes it with the intention to deal with online gambling early in 2017. Additionally, the Senate could decide to do nothing. It could conceivably let both issues bleed into 2017, and try to get a tax share fix passed before the court deadline in late January, and work on online gambling throughout the spring. As fluid as this issue has been, it could become even more volatile after the November 8 elections. It’s becoming quite apparent that some casinos are far more interested in online gambling than others, and still others are working to create the most favorable business climate possible. For example, there was the recent push and shove in the pages of Gambling Compliance between Penn National and PokerStars over limiting the number of branded skins to land-based Pennsylvania casinos. There is also Parx Casino’s on-again-off-again relationship with legal online gambling. And of course, there is the steadfast opposition coming from the Sheldon Adelson-owned Sands Bethlehem Casino. Eight other seats are being contested, but only a few are polling as close races. Thirteen other incumbent senators are running unopposed. The number of people leaving the legislature, and who those people are, could influence how an online gambling legalization vote would go during the lame duck session.